Charles Edward Ball was a pre-war regular. His service number, 5998 was issued by the 2nd Battalion of the South Lancashire Regiment as far back as 1899. The 2nd Battalion of the South Lancashire Regiment landed in France on 14th August 1914, just over a week after the outbreak of war. They disembarked at La Havre with a strength of 27 officers and 980 other ranks and then travelled by train to Mauberge. They marched over the next few days through areas of northern France where the civilian population turned out in droves to meet and salute them, ultimately arriving at St Hilaire on the 20th August. On the 21st, they again marched off, this time towards the Belgian border, finally arriving at Framiers in the late afternoon of the 22nd. They were then informed that the Germans had occupied Brussels and that the next day they would be moving forwards to engage the enemy. On the morning of the 23rd they marched off and by mid-afternoon they could see shells bursting over Mons some 2 miles away. Battle was imminent. By 5.30, they were entrenched and ready for action. Early next morning, the 24th, shortly before 4am, the German infantry in masses and firing from the hip, came straight for the positions occupied by the Battalion, and were met by defenders with rifle and machine gun fire. The battle raged for several hours and over 1,000 German troops were estimated to have been killed. But after several hours of intense fighting against overwhelming odds, the Battalion was forced to retire from their positions covering Mons-Conde Canal to avoid being outflanked. The retreat from Mons had commenced. By the time the battalion reached Coyelles on the 29th and was able to regroup, the muster amounted to 14 officers and about 400 men, about half of its original strength. It isn’t clear where Private Ball fell in action. His body was never identified, denying him a marked grave and he is remembered on the Ferte-sous Jouarre Memorial to the missing. Medal entitlement: - 1914 Star, British Star and Victory Medal. 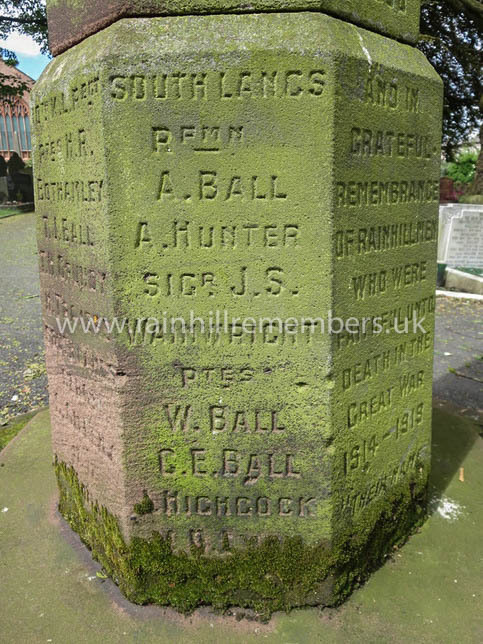 The name of Charles Edward Ball of the South Lancashire Regiment is inscribed on the WWI Memorial in St. Ann's Churchyard.